COMPLETE IELTS: BANDS 5-6.5 is a brand new course to prepare students for the IELTS test at an intermediate level (B2). It combines the very best in contemporary classroom practice with stimulating topics aimed at young adults. It is designed to introduce students to the critical thinking required for IELTS and provide strategies and skills to maximise their score in all parts of the test. 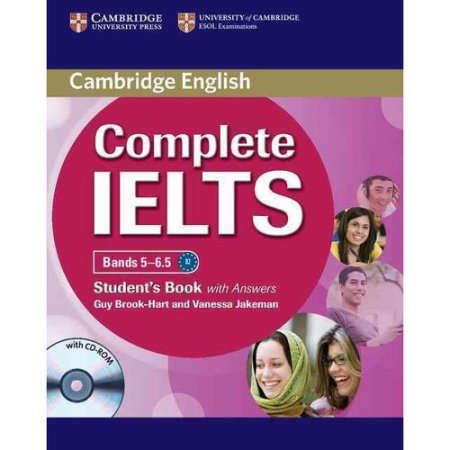 Informed by Cambridge's unique searchable database of real exam papers, the Cambridge English Corpus, COMPLETE IELTS: BANDS 5-6.5 includes examples and 3xercises which tackle key IELTS problem areas at this level, making it the most authoritative IELTS preparation course available. COMPLETE IELTS: BANDS 5-6.5: STUDENT'S BOOK WITH ANSWERS FEATURES: 8 topic-based units, providing language input and practice for each of the four papers of the IELTS test. A step-by-step approach to the task-types for Reading and Listening. Practice in Writing and Speaking tasks. Key Grammar and Vocabulary sections. A Language reference with further grammar and vocabulary explanations. Writing and Speaking references with tasks, sample answers and exercises. A full IELTS practice test. Recording scripts for the listening and speaking material. A CD-ROM for self-study. Answer keys with sample answers.